Mirvaso topical gel is one of the most popular forms of rosacea treatment. It is used once daily to reduce redness associated with rosacea. Mirvaso rosacea treatment can be bought from the Independent Pharmacy following a simple medical questionnaire being approved by our doctors and can be delivered quickly and discreetly to a location of your choice. Save money on topical medication for rosacea by purchasing online. Delivery is free over £40, otherwise, costs are found below. You cannot buy this form of rosacea treatment over the counter. Obtain a rosacea cream prescription from your doctor or through The Independent Pharmacy. Mirvaso face cream for redness is available to buy from The Independent Pharmacy’s online doctor service to help to treat rosacea, following a free consultation. To find out more about rosacea and see all the available treatments, see our rosacea advice page. The active ingredient in Mirvaso rosacea gel, brimonidine tartrate, belongs to a group of medicines called alpha agonists. 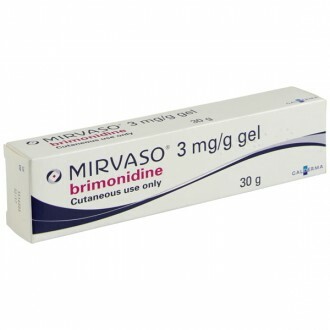 Mirvaso is the brimonidine brand name. These medicines work by stimulating the alpha receptors found in the muscle walls of the blood vessels. When applied topically, it causes these blood vessels to contract. This decreases the flow of blood through the vessels, resulting in the reduction of redness. Mirvaso gel is topical rosacea treatment that works on a daily basis to reduce facial flushing and redness. If you forget to apply on any given day, then the redness for that day will not be reduced. You should not double the amount the following day to compensate. 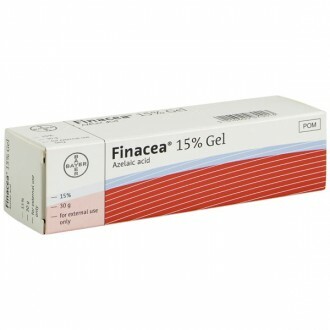 Mirvaso gel is a prescription-only medicine that is mainly used to treat rosacea. It contains the active ingredient brimonidine tartrate at 0.33%. This means that every gram of Mirvaso gel contains 3.3mg of the active ingredient. Topical Mirvaso gel is manufactured by Galderma and comes in a 30g tube. Each tube is accompanied by a comprehensive patient information leaflet. Mirvaso gel is for external use only. It can also be found by searching for brimonidine gel uk. Rosacea is a chronic condition characterised by recurrent episodes of facial flushing, redness and spots. The areas of the face commonly affected are the cheeks, nose, forehead and chin. Rosacea occurs when the blood flow to the facial skin increases. This is due to the small blood vessels in the skin dilating, allowing for an increase in blood flow. There’s no set cure for rosacea: it all depends on the severity of your symptoms. Those with more severe symptoms may be prescribed an oral antibiotic to reduce inflammation. The antibiotics commonly used to treat rosacea include tetracycline, oxytetracycline, doxycycline and erythromycin. Red face treatments – such as rosacea cream and topical brimonidine – also help to keep the symptoms under control. It helps to know your triggers. Direct sunlight, for example, can often make symptoms worse – as can wearing too much makeup or using harsh skincare products. Rosacea sufferers should take care to avoid other potential triggers, such as emotional stress, alcohol, spicy foods, hot baths, extreme weather and caffeine withdrawal. Rosacea tends to appear in stages, starting with pre-rosacea, where the skin is slightly red or flushed in appearance. This can develop into inflammatory rosacea, where alongside redness you may also experience pustules, red bumps and cysts. The third stage is vascular rosacea, where the sufferer may experience swelling of the nose and cheeks, and the skin can become especially sensitive. Topical cream for rosacea is usually prescribed at first sign of symptoms. Rosacea typically has four subtypes: erythematotelangiectatic rosacea, papulopustular rosacea, phymatous rosacea, and ocular rosacea. Erythematotelangiectatic and papulopustular rosacea are characterised by redness, visible blood vessels and acne-like breakouts. Phymatous rosacea is where the skin becomes thicker, and has an almost bumpy texture. By contrast, ocular rosacea occurs only on the eyelids. Mirvaso can be used in conjunction with other rosacea creams, such as Rozex. It can also be used with makeup and cosmetics. They should only be used after the applied Mirvaso has been absorbed into your skin. They are typically mild to moderate in severity, and usually do not require Mirvaso use to be stopped. These side effects can feel like a worsening of your initial symptoms, and it is impossible to predict if you will experience them before you try Mirvaso. For this reason, we recommend that you order just one tube to start with, and use the gel on a small area of the face at first. Mirvaso rosacea gel contains brimonidine tartrate 0.33% as the active ingredient. 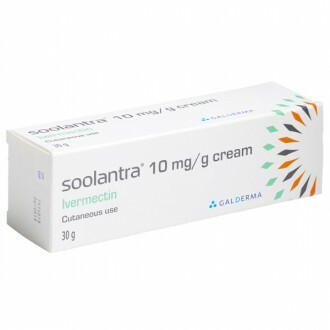 This is a common form of medication for rosacea redness. 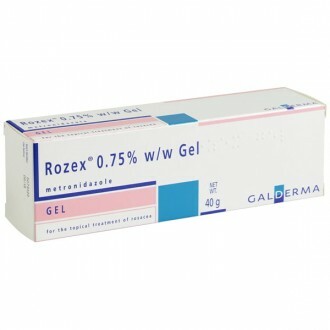 Mirvaso gel is a prescription medication for rosacea. Always ensure you read the patient information leaflet enclosed with Mirvaso before using the gel. You will need a rosacea prescription in order to buy Mirvaso gel online. Need to know more about Rosacea? Mirvaso gel is the only licensed product available to treat redness and flushing in rosacea. It contains the active ingredient brimonidine. It starts to work in as little as 30 minutes and lasts for up to 12 hours. Mirvaso is effective at reducing redness in 70% of patients suffering from rosacea. It can be used by patients of any age over 18 years old and it is just as effective for teenagers and the elderly alike. The symptoms of rosacea can include facial redness (around the central part of the face), swollen blood vessels on the nose and skin, and tender bumps and lumps on the skin, which can be hot and tender to touch. These symptoms are believed to be caused by the dilation of blood vessels and increased blood flow to the area. Mirvaso constricts or narrows the blood vessels, which reduces the blood flow and therefore reduces the symptoms of rosacea. You can also help to keep the symptoms under control by using by using these self-help techniques. How do I apply Mirvaso rosacea gel? Apply Mirvaso gel once daily to dry skin (application to wet skin can cause the gel to run into the eyes or mouth). Using a clean fingertip, apply one small pea-sized amount of gel to each of the following affected areas - forehead, both cheeks, nose and chin - up to five in total. Allow the gel to dry before applying makeup or other cosmetics. Take special care when applying around the eyes. If any gel gels in the eyes it should be washed out thoroughly with water straight away. Wash your hands after use to limit the constriction of blood vessels in the hands and fingers. What’s the difference between Mirvaso and other rosacea treatment? Papules and pustules - These are lumps and bumps on the surface of the skin which may be red, hot and tender to touch. They are normally caused by bacteria that live on the skin. Azelaic Acid and Metronidazole are used to treat mild to moderate pustules and papules. They are applied once or twice a day. The Azelaic Acid is more effective but comes with a greater incidence of side effects. Treatment needs to be continued for a few weeks before a significant difference is usually seen. Erythromycin (antibiotic) is used to treat papules and pustules which are greater in number and severity and unresponsive to other medicines. It is also used when there is inflammation. 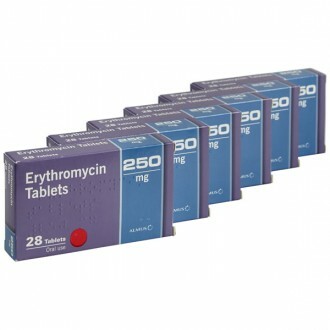 Erythromycin needs to be taken for 4 - 6 weeks before a significant difference is seen. Facial redness and flushing - symptoms caused by expanded blood vessels. Mirvaso reduces the blood flow thought to be responsible for the redness and flushing. When it is applied once a day a difference can be seen in as little as 30 minutes, lasting for up to 12 hours. Some patients may experience a worsening of the redness, usually within the first 2 weeks of treatment. If you stop using the gel this will get better by itself. You should test a small portion of the skin with the gel before restarting and if it occurs again the treatment should be discontinued. Oral Treatments – Clonidine, beta-blockers and anxiety medication prescribed under the supervision of a dermatologist can reduce redness and flushing. The mode of action in reducing rosacea symptoms remains unclear. This usually occurs on the nose (rhinophyma) and if severe can be treated with surgery, dermabrasion or laser treatment. Laser treatment involves having narrow lasers aimed at the visible blood vessels in the skin, causing them to shrink so they're no longer visible. It can be mildly painful, with possible side effects including temporary bruising and swelling. Is it safe to use Mirvaso gel continuously? Mirvaso can be used continuously. It needs to be used every day for the redness and flushing to be controlled. What are the side effects of Mirvaso? Very little Mirvaso gel is absorbed into the bloodstream and circulated around the body. It is applied in smaller amounts where it is needed, therefore it is well tolerated and most of the side effects occur where the gel is applied. Some patients find that the gel makes the redness worse (this may be coupled with itching and burning sensation too). This usually happens within the first 2 weeks of treatment. If this happens stop the gel and treat accordingly with painkillers and antihistamines where necessary. Test using a small amount of gel before restarting treatment. Discontinue if the redness worsens again. Mirvaso may also cause acne, dry mouth and cold feeling in the hands and feet in less than 1% of users. How long will it take for Mirvaso gel to work? Mirvaso will start to work in as little as 30 minutes and lasts for up to 12 hours. What do you do if you miss an application? The effects of Mirvaso last for up to a day. It needs to be applied daily to be effective. If you miss an application you won't experience any reduced redness for that day. Do not apply two or more applications in a day as this increases the chance of side effects without an increase in a reduction in redness. Can I use Mirvaso and make up together? Apply Mirvaso gel as usual and allow to dry completely before applying makeup and other cosmetics (including camouflage creams like Veil cover cream). As long as Mirvaso has had time to absorb into the skin there is no problem applying makeup or cosmetics over the top. Is there anyone who should not use Mirvaso rosacea gel? Patients who are pregnant or breast-feeding should not use Mirvaso because it may affect development of the unborn baby. The concentration of Mirvaso in breast milk has not been established. Mirvaso does not have any effect on fertility. Mirvaso is not to be used by patients under the age of 18 years old. Mirvaso should not to be used by patients with liver or kidney problems as the effects have not been established. Do not use on irritated or open/broken skin. Patients with poor circulation in their hands and feet or with low blood pressure or a tendency for their blood pressure to fall should not use Mirvaso gel. Can I use Mirvaso with other medication? Medication used to treat Parkinson’s, namely selegiline. Chlorpromazine used to treat psychiatric disorders. Methylphenidate for the treatment of hyperactivity. Reserpine for high blood pressure (not commonly used in the UK). Digoxin and other cardiac glycosides used in treating heart failure. Propranolol and other beta-blockers for treating high blood pressure. Amlodipine and other calcium channel blocker commonly used to treat high blood pressure. Alpha agonist drugs like clonidine. Alpha blocking drugs like prazosin used for treating high blood pressure, asthma or a slow heart rate. Is there an unbranded version of Mirvaso gel? 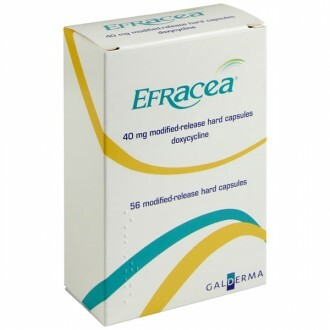 Galderma, the manufacturers of Mirvaso, are currently the only licensed manufacturers of the brimonidine gel in the UK. As the patent for this product has not yet expired, there is no unbranded or generic alternate on the UK market. Rosacea and couperose: what’s the difference? The two skin conditions can appear very similar. The main difference is that couperose occurs due to the capillary walls expanding, whereas rosacea is an inflammation of the skin. However, some rosacea sufferers may experience couperose skin as an initial symptom. Prevalence of couperose is usually down to sun exposure, extreme temperatures and lifestyle habits, such as smoking and drinking alcohol. Can changing your diet improve rosacea? Certain dietary changes may help to reduce the symptoms of rosacea. It’s a good idea to avoid trigger foods and drinks, including certain vegetables, alcohol, caffeine, citrus fruits, refined sugar, beef and seafood. Some vitamins and minerals also have anti-inflammatory effects – seek professional advice before adding supplements to your diet. Do I have rosacea or dermatitis seborreica? Seborrheic dermatitis is also an inflammatory skin disorder, and most commonly appears inside the ears, on the forehead, in the eyebrows, and around the nose. It’s characterised by scaly/greasy/yellow patches of skin and is often accompanied by dandruff – but no acne bumps or pustules, as with rosacea. If you’re uncertain what you’re suffering from, get a free online consultation and we’ll help to identify your condition. Often, people with rosacea also have seborrheic dermatitis, and these different conditions must be treated separately. If you’re only suffering from dermatitis, you will likely be prescribed a treatment like E45 Itch Relief Cream or Dermol Cream. Mirvaso is the brand name for the active Ingredient brimonidine.